NBA • Hall-of-Famer will work with Jazz duo in Louisiana, and maybe Salt Lake City. 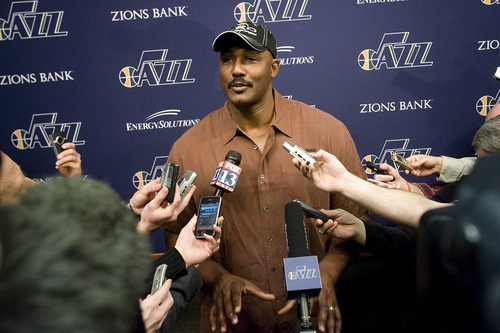 Photo by Chris Detrick | The Salt Lake Tribune Karl Malone talks to members of the media at EnergySolutions Arena Friday February 11, 2011. Jeremy Harmon | The Salt Lake Tribune Karl Malone talks to reporters about Jerry Sloan's resignation before the Jazz game against the Phoenix Suns on Friday, February 11, 2011. 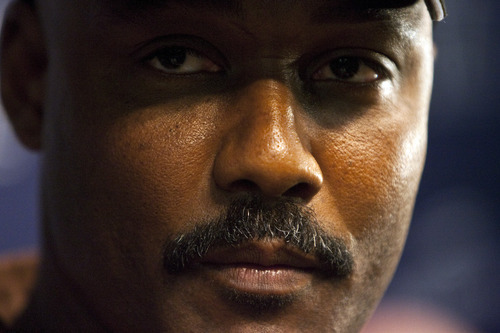 Karl Malone is returning to the Utah Jazz  not as a 50-year-old power forward but as a part-time tutor for the team&apos;s young big men, Derrick Favors and Enes Kanter. Malone was approached by head coach Tyrone Corbin about the possibility of him working with Favors and Kanter after the season. The franchise&apos;s chain of command recently signed off on the idea and CEO Greg Miller spoke of the team&apos;s new relationship during a Wednesday afternoon radio interview. "I&apos;m not getting bored or anything. I&apos;ve got plenty to do. But I also grew up playing basketball my whole life, so this is exciting for me." At the same time, Malone didn&apos;t make any promises. He called Favors and Kanter "two of the most talented bigs in the NBA right now" but added, "If someone is looking for Karl Malone to come in and wave a magic wand, that ain&apos;t happening. These kids will be as good as they want to be. It&apos;s up to them." Malone has already started working with Favors. Kanter will join the sessions "probably in about a month," after he fully recovers from shoulder surgery. According to Malone, he will approach his new role as mentor "the same way I played  with everything I&apos;ve got." Malone is concerned that his part-time return to the Jazz might be misconstrued as something more. "I&apos;m not going to be sitting on the bench," he said, "and I&apos;m not going to be taking over any meetings. We&apos;ll take some small baby steps and go from there. … I don&apos;t want to be a distraction." Asked about his future with the team, Malone laughed and said, "At any given time, if it&apos;s not working out for the Jazz or myself, we&apos;ll be men about it and go on our way." Perhaps Malone will end up helping former teammate Jeff Hornacek, who was named the new head coach of the Phoenix Suns on Tuesday. Asked if Malone might be part of his new staff, Hornack said, "Karl always wants to coach. I&apos;ll call him and see, but I can&apos;t ever imagine Karl  after two weeks he&apos;ll want to go fishing. It would be great. "I know he&apos;s going to work with Derrick this summer. … I&apos;m happy for Derrick if he gets that opportunity. If Karl&apos;s making the rounds working with guys, I&apos;d love to bring him here to work with a couple guys." Favors was the No. 3 overall pick in the 2010 draft. He came to Utah in the Deron Williams trade with New Jersey two years ago. Favors, who turns 22 on July 15, averaged 9.4 points, 7.4 rebounds and 1.7 blocked shots in only 23.2 minutes per game last season. Kanter, who turns 21 on May 15, was the No. 3 overall pick in the 2011 draft. He averaged 7.2 points and 4.3 rebounds in only 15.4 minutes during his second season in the NBA. Kanter missed the final 10 games after suffering a dislocated shoulder, which required surgery on April 10. Malone, of course, spent 18 seasons with the Jazz. Along with John Stockton, he led the team to five conference finals and two NBA Finals between 1992 and 1998. A two-time Most Valuable Player and first-ballot Hall of Famer, Malone remains the No. 2 scorer in league history with 36,928 points.